Sweet coconut goodness in a cinnamon roll-like package. 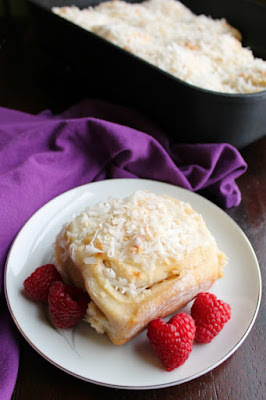 These sweet rolls are loaded with coconut and are the perfect breakfast or brunch treat for Easter or any day! 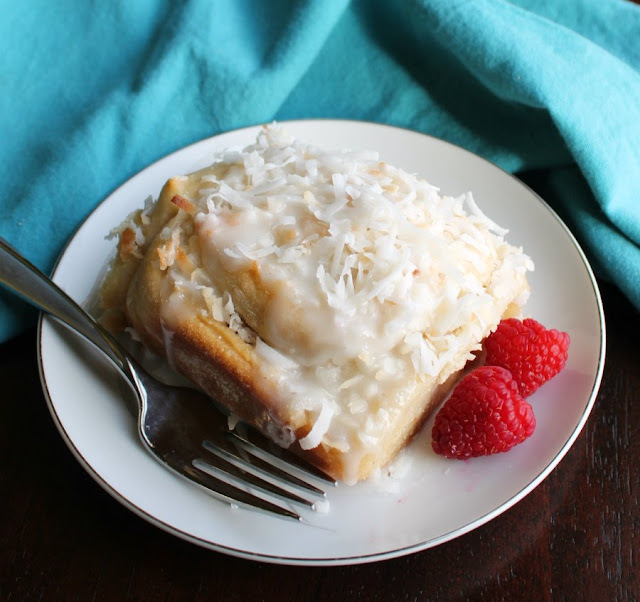 Soft pillowy bread wrapped around loads of sweet, creamy coconut goodness. Now drizzle those in glaze and finish them with some lightly toasted coconut. The results are a thing of beauty, for sure! 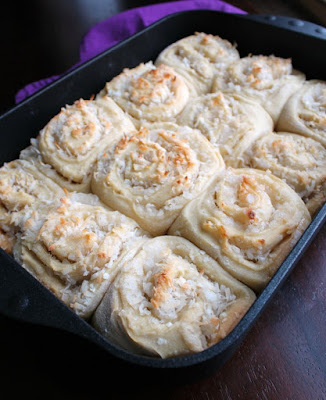 Get your forks ready, these coconut cream sweet rolls are coming at you! I don't know why, but coconut makes me think of Easter. Maybe it's because of the traditional lamb cake that was present at so many of our Easter celebrations. The dough will be a little sticky and shaggy when you are done. Don't worry, it will work out. So when I was thinking of sweets that scream spring, coconut was on my brain. Something that evokes the feelings of coconut cream pie, but I also wanted it to be something completely different. The other thing Easter makes me think of is brunch, so it seemed fitting to marry those two trains of thought together into something delicious. That, my friends, is how these coconut cream sweet rolls were born. 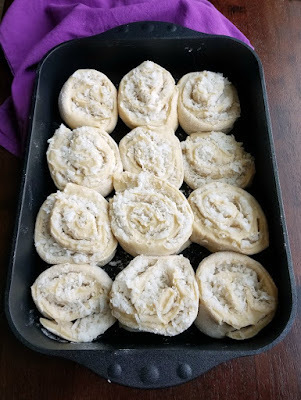 Ever since I made my first batch of knock your socks off cinnamon buns, I have been hooked on using potato dough for sweet rolls. It just makes the softest, most delicious cinnamon roll I have ever had! The bread almost melts in your mouth and the centers have that soft almost gooey texture that makes my mouth water just thinking about it! Oh. My. Word. I am not one for reinventing the wheel when you already have a base you love. So I whipped up some of that dough to get these started. But instead of a cinnamon sugar center, these babies are absolutely loaded to the gills with coconut. Instead of butter, I used coconut oil in the center to reinforce the coconut flavor. 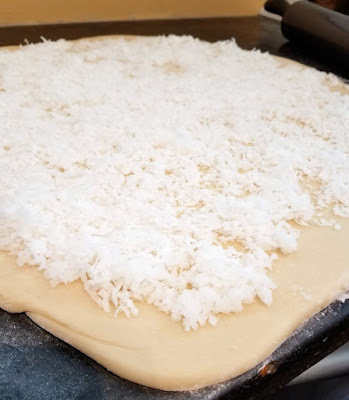 Now I knew all of that sugar, coconut and coconut oil had a chance of getting a little crazy in there where it was getting all gooey and scrumptious. So I was really happy to have my new Swiss Diamond roasting pan to bake these in. I've told you before, but I just love my Swiss Diamond Skillets and especially my saute pan. The finish is amazing and things just wipe right off. So I knew these little beauties would pop right out of this pan as well. Plus clean up would be a breeze. Luckily I was right on both counts! The rolls looks amazing when they came out of the oven. My frosting loving heart couldn't leave them like that though. Of course not!! So I whipped up a glaze and toasted some coconut in a skillet. Spread that glaze over the rolls while they are still hot. That is where the magic happens! It melts down in those cracks and crevices and helps bring it all together. Ummmm! The toasted coconut helps you to advertise what you have. Sweet, scrumptious, coconut goodness wrapped up in a pretty little package. I am telling you, if you are a coconut fan you have to give these a go. Just make sure you have some guests over so you don't eat the whole pan. It is so tempting! I hope you have been enjoying Spring Sweets Week so far. I know I have been! Be sure to enter to win some of the fabulous prizes from our sponsors. Swiss Diamond has an excellent contribution that you could win. Check out the great prizes you can win in the lemon ricotta crepe post and check out the disclaimers at the bottom of this post. Good luck to you, I hope you win something great! First get your potatoes ready. A large potato or a couple of medium potatoes would work. Peel and cut the potatoes, cut into cubes and boil until it's soft. Pour 1/4 cup of that water into a small bowl or measuring cup to proof the yeast. Drain the rest of the water and return the potato cubes to the saucepan. Mash until smooth. Once water is about 110 F, add the Tablespoon of sugar and the yeast. Set aside while it activates. Add the milk, butter, salt and 1/2 cup of sugar to the potatoes. Stir and warm over low heat until warmed through. Place the warm potato mixture in the bowl of your mixer. Stir in the egg, vanilla and yeast mixture. Slowly add in the flour. Stop adding more flour while the dough is still sticky, but it should at least come together into a dough. 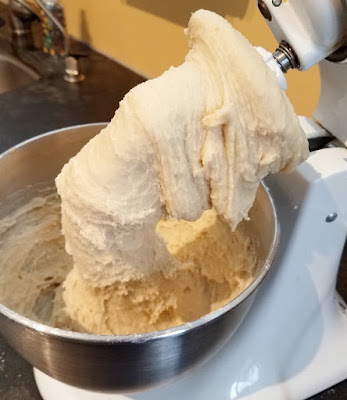 Use the dough attachment, allow your mixer to knead the dough for about 5 minutes. Add a little more flour if needed, but don't add any more than you have to. It should be loose, but it should come together into a dough. Turn the dough into the buttered bowl, being sure to scrape the bowl out all the goodness. Cover and allow to rise to at least double its size, about an hour to an hour and a half. Punch down the dough and give it a couple of quick kneads to make sure it is deflated. Place on a lightly floured surface. Let rest for about 10 minutes, then roll into a 18" square. Grease a 10x15 pan or a half sheet pan. Brush with melted coconut oil and sprinkle with sugar and coconut flakes. Roll dough into a log and cut into 12 equal pieces. Place in greased baking dish. Cover loosely with a towel and let rise for another hour. Preheat oven to 375 F. Bake for 20 minutes, rotating pan half way through. The tops should be light golden down. Let sit for about 5 minutes, then put together the glaze. In a small bowl, beat together the glaze ingredients together. You want it to be thick, just barely thin enough to pour. Drizzle glaze all over warm sweet rolls. Sprinkle with toasted coconut. Devour! I LOVE coconut, plus I love sweet rolls. This looks like my kind of combination. What delicious cake! Perfect for Spring. Can't wait to try these. My mom is a coconut fan so I will make them to share with her. I hope you both love them! Thank you, they were soft, sweet and yummy! These look so delicious! I with the hubs liked coconut. These might have to wait until I start working again. Because I can't NOT make them. Ha! It is nice to have coworkers to share with! Coconut is a great touch for an Easter treat! These sound amazing! It's been too long since I made homemade sweet rolls! This version sounds really scrumptious. They are soft and sweet and so coconutty! Sweet rolls are my jam- I love this flavor combo! I agree that coconut and Easter go together. I think it's because of the chocolate coconut nests that my Mom would make and fill with jelly beans. I ate way too many of them myself! You keep killin' it with your sweet rolls!!! Delish! Using coconut cream sounds amazing. These rolls are gorgeous. I love using it for sweet rolls, the results are so soft and scrumptious! What a fun "spring" twist on a sweet roll! They sound so good! 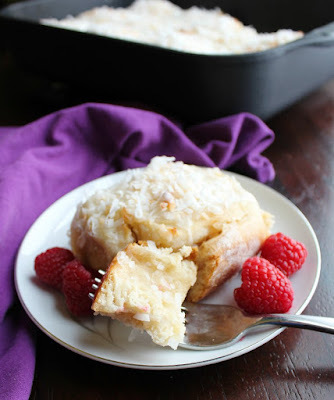 Coconut sounds so delicious in a sweet roll. I always make cinnamon rolls around this time of year, but I would love to try these instead. Thanks for sharing your yummy recipe!